If you are a Japanese food enthusiast like me or just someone trying their hand at the Japanese delicacy Sushi, you need a way to not mess up your rolls and fillets. What you are lacking in your kitchen even after purchasing all the needed ingredients is a tool to gracefully and precisely cut through those sumptuous rolls. This is where you will look for the best sushi knife. Finding the best sushi knife is a painstaking and mammoth task. But fret not; we have taken the responsibility of acquainting you with the best of sushi knives so that you can make an informed and justified decision. You can pick one up from the list below according to your own taste and style while we have taken care of the quality of these. These sushi knives are great for an amateur as well as a professional chef. Also, if you are looking for some Japanese kitchen knife, we have a written list of the best Japanese knives. Click on the link to read more. The name says it all. This sushi and sashimi knife from Okami is one of the best quality sushi knives you will come across. It is sleek, sturdy, and durable and moreover, it is designed to deliver great performance while taking care of your hands. It is ideal for dicing, slicing, mincing and regular cutting and chopping as well. Numerous chefs all over the world are known to be practicing their art of sushi making with the help of this revolutionary knife. The blade is made out of stainless steel alloy. ​It weighs 7 ounces, which means your hands do not suffer fatigue. ​The wooden handle provides easy grip on the knife. The knife comes along with a cleaning cloth, edge guard, and plastic cover. This knife will definitely stand the test of time and is unarguably the best sushi knife out there. Order it today, as they say, ‘You gotta have the right tools for the job’. You can find this sushi knife on Amazon. The Yanagiba sushi knife measures 8.25” in length and is the ninja you need against sushi and sashimi. The single blade design empowers it to slice those super thin slices with extra precision, devoid of food pieces sticking to it. This knife is sturdy and dishwasher safe as well. The knife is Japanese inside out, from the engineered high-carbon, stainless steel blade to the perfection it delivers. What’s more, the steel blade is infused with an antibacterial agent so that your food is safe and clean. The steel it is crafted out of is Daido 1K6 high-quality carbon steel and is stainless. The handle is easy to hold and is composed of plastic mixed with bamboo powder. ​The blade comes with a limited lifetime warranty, and it is made in Japan. A range of 5 different sizes along with 8 different styles are available from Kai, so you can choose one which accurately suits your requirements. This cheap sushi knife has everything we look for in a sushi knife; it is sharp, thin, light and highly maneuverable – all at a very convenient price tag. It clearly is one of the best sushi knives in the world. If you are serious about sushi and are just starting out, then this is the perfect sushi knife for you. The blade and handle are properly honed to provide your sushi with the best and most precise cuts. The sharp blade is single edged and is carved out of stainless German steel which is highly rust and corrosion free. The steel quality is high and is made up of high carbon. The handle of the knife is made out of pure wood, so you get a firm grip on it while slicing and chopping. The safety and performance associated with Mercer are unsurpassable, and the knife ensures that you cut through the sushi without crushing the roll. Many kitchen enthusiasts and professionals trust this product, and an added advantage is that this sushi knife is dishwasher safe. However, it is recommended to wash the knife with warm water, and harsh chemicals and detergents must be avoided. The knife weighs 8 ounces and is 10” in length. With over hundreds of happy customers, you can be sure of a good investment. 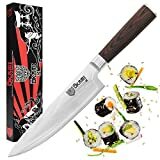 We go through hundreds of products listing at Amazon and also study the ratings left by previous buyers to find the best sushi knife for you. Besides that, we also calculate the overall n﻿﻿et ﻿c﻿﻿ustomer﻿﻿ satisfaction (NCS) grade because we want to see how happy is the previous buyers with their purchase of the product. From our finding, we can say that Okami, Kai and Mercer are the best sushi or sashimi knife brands. These brands are popular and received many excellent ratings for their products. Also, the Best Chef Knife by Okami, Kai Yanagiba Knife and Mercer Sashimi Knife score favorably for the ratings as well as the NCS grade compare to the rest. We believe that you would find these sushi knives a good buy too. Sushi knife sets are designed and created using a single angle bevel, which means that only one side of your sushi knife is sharpened enough to seamlessly and clearly cut through the sushi providing the perfect angle. They are crafted using high-quality carbon steel which gives sushi knives that superior and finer edge over regular ones. Also, a knife particularly created for sushi has a much thinner and sharper blade which is apt for producing those artistic cuts and angles. Regular blades are not easy to maneuver with as they are very heavy to begin with. Sushi knives, therefore, are specially built for the preparation of your artistic feast. A word of caution – sushi knives are high maintenance and are prone to rust, so take precautions to ensure the longevity of your investment. Maintenance of sushi knives is a little different and more cautiously done as compared to regular knives. Sushi knives are not made up of ceramic or pure stainless steel; rather they are fabricated from high-carbon steel. One needs to take precautions in order to ascertain their durability. Failing to do so may result in development of rusty spots on the knife blade. Refrain from cutting bones, frozen items and any other food ingredients other than those that go into making delicious sushi. Always make smooth, clear cuts and avoid twisting the knife frequently. Carbon steel sushi knives need to be thoroughly cleaned and dried after every use. Though some knives boast about how dishwasher safe they are, the best way to ensure their longevity is by cleaning them manually with a mild soap and some warm water. You can read about more tips on how to care for your sushi knives here. Overall, we have seen a few sushi knife brands, and you can now confidently make a conscious decision of buying the best sushi knife for yourself. We hope you found this guide useful. Do check out these knives for yourself and tell us how you found them.